There are many ways to send video transmissions and there are as many different connectors/adapters as there are ways to transmit. The BNC-M-RCA-F male to female adapter is just one of those combinations that is available. In this article we'll take a look at some of the ways video data is sent and the connectors that are used to hold everything together. There are many ways to send video transmissions and there are as many different connectors/adapters as there are ways to transmit. The BNC-M-RCA-F male to female adapter is just one of those combinations that is available. In this article we’ll take a look at some of the ways video data is sent and the connectors that are used to hold everything together. Before we get ahead of ourselves talking about the BNC-M-RCA-F Male to Female Adapter, let’s take a broader view of the entire digital video security and surveillance system. This will help us to understand what we need and why we need it. A typical digital video system consists of one or more cameras, a Digital Video Recorder or DVR, and one or more monitors (technically, a monitor is only required for setting up the system). The digital video camera captures light images and converts them into electronic signals in the form of digital data which represents the camera’s field of view. These signals need to be transmitted to the DVR or a monitor or both. Once the DVR receives these signals it compiles them into a computer legible digital video file. This file can be viewed “live” on a monitor and/or saved on the DVR. In terms of power supply, signal transmission, and camera control, there is a lot going on here. We’ll start with power requirements first. The DVR requires typical house current from a standard pug-in outlet and so does the monitor, if present. The camera must have a power supply line (unless it runs on batteries) too. This may be in the form of a safer, low-voltage supply such as 12 Volts DC (Direct Current) or 12 VDC. The cameras may also operate on 24 Volts AC (alternating current). Why two distinct voltages? That’s often up to the camera and system designer, but one reason for using AC instead of DC is that DC declines in power over long distances where as AC doesn’t (at least not enough to affect the device’s performance). Some cameras are able to accept either type of power while others may not. At any rate, all the devices must have electrical power to operate. We won’t go into detail about the power plugs, supplies, etc., but just remember that the power supply and camera operating requirements must match. There are other cabling or wiring requirements too. The camera needs to send its digital video data either by a radio frequency transmitter to a receiver which is connected to the DVR or by a typical digital video transmission cable. The standard cable used in the security camera industry is RG-59 coaxial cable and the standard connector used with this cable is called a BNC (Bayonet Neill-Concelman connector). It is named after the two inventors (Neill and Concelman) and by the way it connects like a bayonet on a military rifle. The BNC connectors are pushed together and twisted, to lock the connection in place. The BNC connector has been the industry standard for many years. 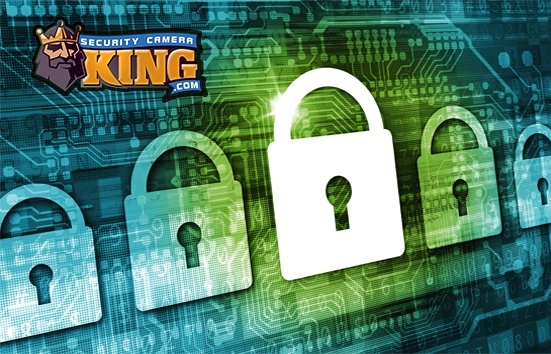 However, since digital video security devices are built by different manufacturers some devices may contain another type of connector, call the RCA plug. Almost all DVRs utilize BNC-F connections, which would require a BNC-M connector on the cable end (coming from the camera). Like BNC connectors, RCA plugs also have a male and female type connector. The source device on an RCA plug usually has a male RCA connector fitting and the receiving device usually has a female RCA connector. So for what is a BNC-M-RCA-F Male to Female Adapter used? Plug the male BNC connector into one of the BNC female connectors on the DVRs input (Video In) you’ve changed the DVR input connector to an RCA female. Now any device (in this case a camera) with a male RCA connector can be used with the DVR. In other words, a BNC-M-RCA-F Male to Female Adapter will allow a male RCA connector to be used with a female BNC connector. This is useful if you want to use a patch cord or if you want to use a monitor that has RCA or composite video jacks. 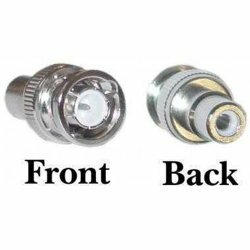 Whether it’s a BNC-M-RCA-F Male to Female Adapter or other connector that you need for your digital security camera system you can purchase them quick and easily at Security Camera King’s on-line catalog and store.